This picture is a digitally souped-up version of a small watercolor piece I did recently for a baby shower my wife attended. 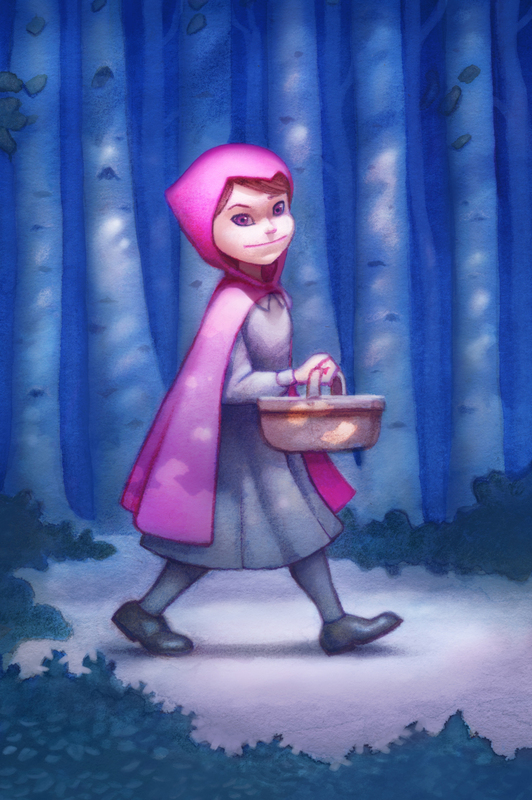 Initially, I intended to do Little Red Riding Hood, but the story seemed a little threatening. A little girl gets accosted by a wolf in the woods and later finds her grandmother eaten up. It didn’t seem a perfect fit for an infant baby girl. So … I changed it to Little Pink Riding Hood and wrote this rather benign poem that we stuffed in the picture frame. Maybe in a few years they’ll open the frame and find the poem. The original painting in the frame can be seen on the Zach Franzen Illustration Facebook page. Is that of the girl in a hood that was pink. The answer for this is quite simple I think.. Nor troubled while taking her grandma baked goods. She skipped and she sang on the road without stress. For there on the path strode a woman in white. Twas grandma who laughed and said “Oh what a sight! Where picnics and cheer make no good earthly sense.. Enjoyed a fun meeting and ate in the wild. I love your artwork and your stories that so often accompany the illustrations are perfect for sharing with my kids (Levi is almost three and Kate is almost one). Thanks for sharing them with us. Thanks Isaac. I checked out your church website and was excited to see your vibrant, thriving congregation. Good to hear from you. I love how you gave a gift that will give again in the future when the picture frame is opened! What a touching and beautiful poem as always Zach. Your illustrations and poems inspire and evoke much thought.